Music lovers trekking to summer festivals often incorporate more adventures into their trips than just the weekend events themselves. With that in mind, a guide to six unique annual happenings comes complete with music-friendly hotels, melodious places for food and drink and other diversions guaranteed to hit the right notes for the discerning musical traveller. 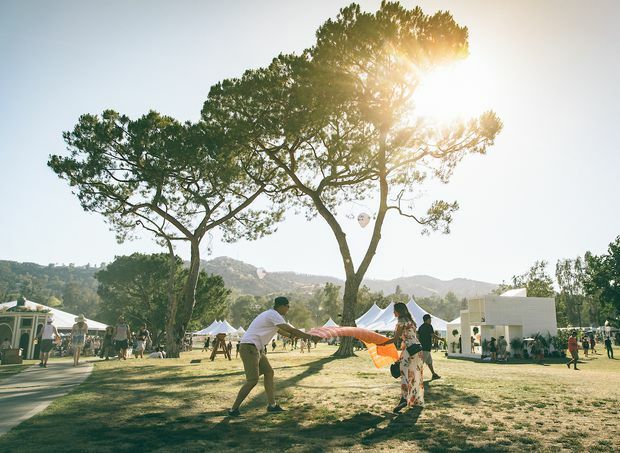 Run by the Coachella promoters, the second annual Arroyo Seco Weekend leans to guitar rock. Where else to go: Not only is McCabe’s Guitar Shop the spot for acoustic and folk instruments in the beachfront city of Santa Monica, the music store also hosts intimate concerts. While past performers include Jackson Browne, Joni Mitchell and Stan Rogers, this summer’s schedule accommodates Tom Paxton, Peter Case and Joan Shelley. Where to stay: Recommended local lodging includes The Langham Huntington and the Bissell House Bed & Breakfast, but rock ’n’ roll enthusiasts with a sense of history might wish to hunker down at Los Angeles’s Sunset Marquis (which has its own recording studio) or the Andaz West Hollywood, a Hyatt property known as the Riot House when members of the Rolling Stones, the Who and Led Zeppelin were throwing televisions off balconies. Presumably the reception is better these days. Where to eat and drink: At C-Boy’s Heart & Soul, the hot dogs are free on Sundays, which is when the juke joint offers its health-code-be-dammed game of chance involving random chicken droppings and bingo. The birds are back in the coop for the rest of the week, allowing for regular appearances by such blues legends as Jimmie Vaughan, Paul Oscher and Miss Lavelle White. Where to stay: Rooms at Hotel Saint Cecilia come with essential amenities – and by “essential,” we mean Rega turntables and Geneva Sound System stereos. A lending library is stocked with vintage LPs and a collection of rock biographies, and a concierge can arrange a guitar loan. Buddy Holly never had it so good, but you can. Basia Bulat performs on the main stage at the Calgary Folk Music Festival. Where to stay: The festival offers special rates for attendees at a variety of downtown hotels, including the Westin Calgary, which is where the performers often stay and where after-show parties have been to known to happen. Where to eat and drink: Baker’s Keyboard Lounge claims to be the world’s oldest operating jazz club. And while Chicago’s Green Mill Cocktail Lounge would dispute that boast, Baker’s piano-shaped bar, catfish-favouring menu and history of legendary artists is legitimate. Where to stay: Detroit’s downtown has undergone a revival of late. New hotels satisfying the need for rooms include the Foundation Hotel (in the former Detroit Fire Department Headquarters) and the Siren (occupying the former office building of Wurlitzer, makers of organs and jukeboxes). Further afield, on Mackinac Island in northern Michigan, the luxurious Grand Hotel (where Thomas Edison’s newfangled phonograph was first demonstrated) has jazz and classical musicians on staff. Sawdust City Music Festival offers a multivenue experience in the heart of Ontario’s Muskoka region. Where else to go: The legendary Kee to Bala concert venue and bar located on Lake Muskoka has played host to everyone from Count Basie to the Tragically Hip. This summer’s schedule includes patio-lantern appearances by Kim Mitchell, July Talk and, on the August long weekend, the Trews. Where to eat and drink: The owner-operators of The Oar restaurant are dedicated music supporters who just happen offer a mean wild boar, venison and blueberry burger on their menu. Live music is common, as are wedding receptions. Where to stay: The acoustic guitar in the common room of the Inn on Bay bed and breakfast in Gravenhurst is in tune and available for strumming. 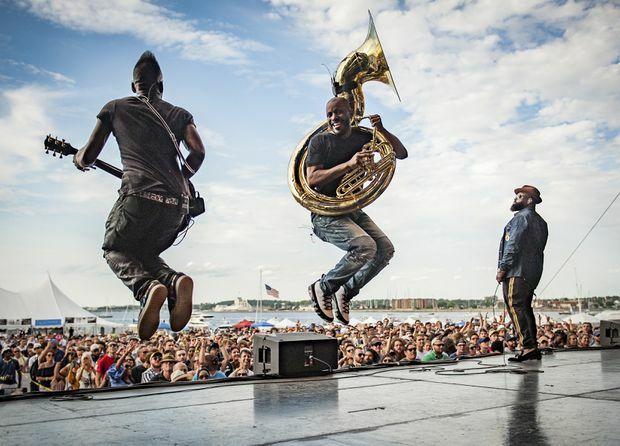 The Roots perform at the Newport Jazz Festival. Where else to go: Newport Jazz’s sister event is, of course, Newport Folk Festival (July 27 to 29). 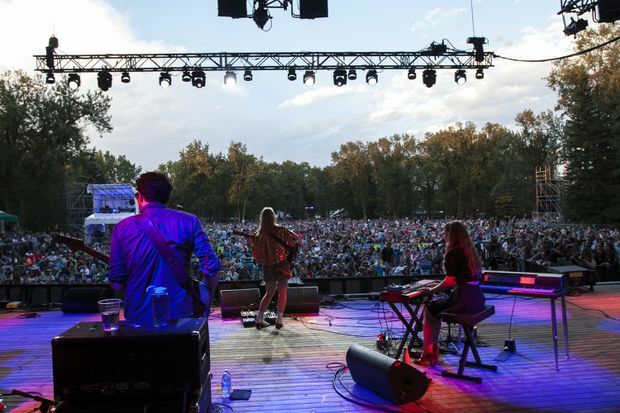 Highlights include Valerie June, St. Vincent, Jason Isbell and the ubiquitous Margo Price, along with Canadians Colter Wall and Tamara Lindeman’s Weather Station. Where to eat and drink: Seafood is plentiful in town, but for spirits try Newport Craft Brewing and Distilling Company, the first distillery in 135 years in a state rich in rum tradition. Beer and rum tastings cost $9 and $10, respectively; Yo-ho-ho’s are complimentary. Where to stay: Yachting capital Newport is not without impressive lodging options. For something more melodious, the Verb Hotel, 99 kilometres away in Boston, is a music-themed boutique inn near Fenway Park, a historic baseball stadium also used for concerts. Up to bat this summer are Jimmy Buffett, Foo Fighters, Billy Joel and Pearl Jam. Editor’s note: An earlier version of this article incorrectly said a new temporary exhibit honoring k.d.lang would be unveiled July 11. In fact, it closed June 1.